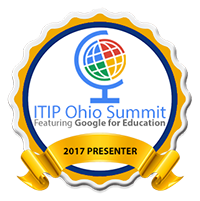 Recently, I attended ITIP Ohio Google Summit in Sandusky, Ohio. It was a conference of over 700 teachers and administrators from all over the state, and beyond. It was a two-day conference focusing on Google Apps for Education and how it can be utilized in schools. I was fortunate enough to be able to share on the topic of formative assessment and how Google Forms can be used to collect, analyze, and share the information with staff and students. It's always fun to share how powerful Google Forms are for teachers. Here is my presentation. ITIP Ohio Summit took place this past Monday and Tuesday, in Sandusky, Ohio at the Kalahari Resort and Convention Center. The focus of the Summit was Google Apps for Education. Many sessions were given over the two days. The Conference was hashtagged at #ITIP14, if you'd like to go see what was said. The programs are here. Dusty Miller, of WGTE Public Media, presented on the development of Chrome. She talked about the features and benefits of Chrome. She mentioned some great Chrome Apps and Extensions. She also talked about some of the benefits of using Chrome with Google Drive. PearDeck - John Sowash - An interactive presentation app - "keep you audience engaged"
NearPod - Marcia Kish - An interactive presentation app - "keep you audience engaged"
Shahnyn Moody-Benedict and Angela Maxwell presented on how they use Google Apps for Education in the elementary school. They are media specialists and work with staff and students to use Google Apps to accomplish many tasks. Lisa Johnson-Bowers and Darlene Adamson, from Mentor, presented on many ways to use Google Forms. They provided a lot of examples of how you could use forms and even demonstrated how to create a form. One big feature I liked was the demonstration of how to create a "conditional" survey. Eric Curts, Tech Integration Specialist for SPARCC, presented how Admins can write scripts and rules to allow mail to flow in and out of your organization. He shared many features to help be specific about which members can send and receive email from different groups. These two days have been outstanding. 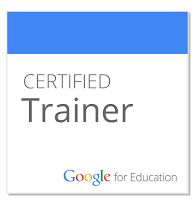 If you are a GAFE user, you should make a point to attend next year.